Students take a quiz in Eric Miller's eighth grade algebra class at Lakes Magnet Middle School in Coeur d'Alene, Idaho. A plan to give Idaho teachers significant raises over five years has finally taken shape in the Idaho legislature. This was one of the main education measures the legislature was expected to take up this year. Many school districts say they struggle to offer the kind of salaries that would help them recruit and keep quality teachers. The “career ladder” bill introduced in the House Education Committee would eventually boost starting salaries for new teachers by about $6,000 -- to $37,000 per year. Top teachers with a master’s degree could make $57,500 a year if they qualify for a $4,000 annual performance bonus. That would be $10,000 above than the current maximum salary. That bonus would be based on how well a teacher’s students do on tests and other measurements of learning. The head of the Idaho teachers’ union called the proposal disappointing. 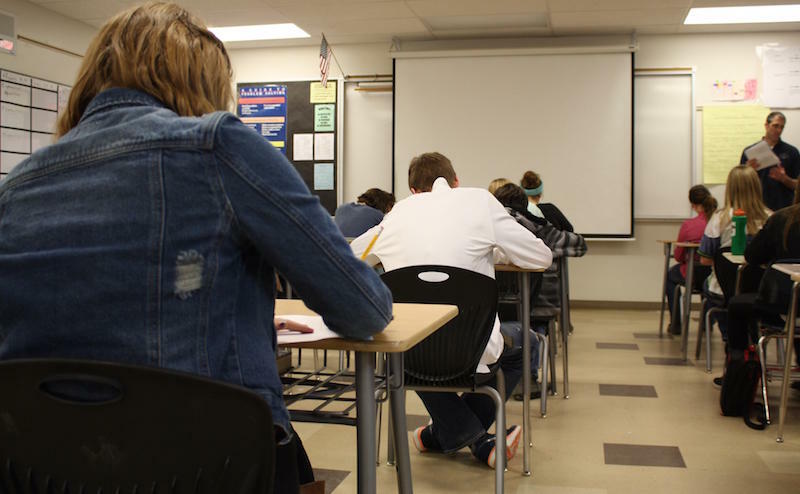 A union spokesperson said the career ladder should better reward a teacher’s years in the classroom and the quality of their teaching. Starting salaries would fall short of the $40,000 a year many education advocates envisioned. The union statement said the proposed salaries still wouldn’t make Idaho competitive with neighboring states. The governor’s office is pushing the proposal, which has a price tag of $125 million over five years. Copyright 2015 NWNews. To see more, visit http://www.nwnewsnetwork.org/. Two months into Idaho’s legislative session, many of the priorities lawmakers set at the beginning of the year haven’t been touched. Legislative leaders say things like road and bridge funding and a tax overhaul may have to wait until next year. At an event organized by the Idaho Press Club Wednesday, Speaker of the House Scott Bedke said he’s optimistic the session can end by March 27. That’s despite the fact that a highly-anticipated bill to give teachers a raise was introduced Wednesday and a comprehensive plan to pay for fixing Idaho’s roads and bridges hasn’t yet surfaced. Three lawmakers refused to attend the Idaho Senate's daily invocation after objecting to the offering of a Hindu prayer. Rajan Zed, guest chaplain, gave a lengthy prayer in both English and Sanskrit on Tuesday that focused on selflessness and peace. Senators from both sides of the aisle shook his hand and thanked him for coming. However three lawmakers, all Republican, only came back onto the floor once the prayer was over: Sens. Steve Vick, Sheryl Nuxoll and Lori Den Hartog. Idaho Republicans want a bigger say in the 2016 presidential election cycle. A bill that would move Idaho’s presidential primaries up two months, into March, passed the state Senate Tuesday. Republican State Sen. Jim Rice says the whole point of elections is to let the voice of citizens be heard. “And there is no citizen who is not impacted by the president of the United States. None,” Rice says.